Are you interested in writing for The Wonderful World of Dance? We’re always looking for dance lovers in the UK and around the world to join our team and contribute to our website and magazine! 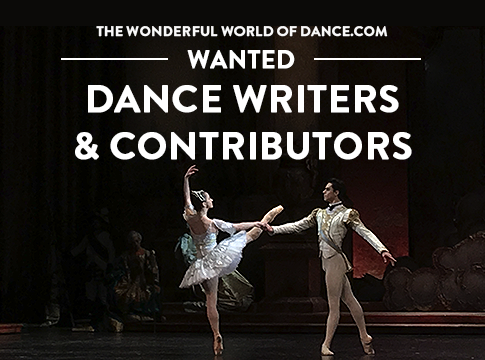 We are searching for writers passionate about dance who would want to review dance shows in London and cities worldwide and interview some of the world’s best dancers, dance companies, and choreographers as well as new artists in the industry! Great journalism experience writing for a popular site. Extensive exposure to your writing. We have 150,000 fans across 50 countries reaching up to 1 million readers a month. You don’t have to be a professional critic, we’re looking for wonderfully talented people passionate about dance, who are friendly, fun, have an engaging writing style and like being part of a wider team. Our Wonderful Team is made up of lovely and talented writers from around different countries and from the dance world. To apply to write for The Wonderful World of Dance, please send an example of your dance writing, review, blog post etc along with your short bio and why you love dance and why you would like to get involved to khrystyna@thewonderfulworldofdance.com. Dance writers & contributors wanted to join our wonderful team!